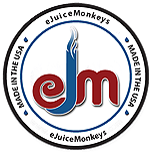 At ejuiceMonkeys, our guaranteed made-fresh-to-order eLiquids are ready to vape, and only get better! We offer a multitude of flavors (thousands of possible flavors! ); four base blends; 0mg, 3mg, 6mg, 11mg, 18mg & 24mg nicotine levels; and 6ml, 10ml, 15ml, 30ml & 50ml sizes. For those who like to keep vendors honest, we encourage you to measure. You'll find our bottles always contain a extra ml! Since opening in 2010 eJuiceMonkeys has believed in responsible over sight and self-regulation. We have never sold a bottle that didn't already meet Consumer Product Safety Commission’s (CPSC’s) standards for child resistance. In 2013, still using the same manufacturer, we changed from child-resistant closures to child-resistant tamper-evident closures. The Child Nicotine Poisoning Prevention Act of 2015 [Public Law 114-116 ] is effective July 26th 2016, and requires all stores to have proof that the e-liquids they sell are complaint with the Poison Prevention Act of 1970 packaging requirements. Please click HERE to view our documents certifying that our e-liquid packaging conforms to all CSPC standards and test for child resistance and suitability for adults in accordance with US 16 CFR § 1700.20. All our e-liquid recipe flavor ingredients as well as our nicotine and non-nicotine bases are U.S.-sourced.We use only high-quality pharmaceutical-grade nicotine, and high-quality, kosher pharmaceutical-grade propylene glycol (PG) and vegetable glycerin (VG), or a combination of both (PG/VG). Blends containing VG may also contain a small percentage of Pure Grain Alcohol (PGA) to create a better consistency (VG is somewhat thicker than PG and can be hard on atomizers). It also helps improve the reduced "throat hit" common with VG blends. 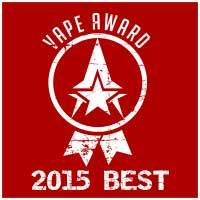 Rest assured, it is not possible to catch any kind of alcohol "buzz" from vaping PGA, even if you vaped only PGA. Nearly all of the alcohol is actually vaporized before it's inhaled. Many things contribute to throat hit, including nicotine strength. For this reason, lower-strength blends have less "throat hit" than higher strengths. VG blends will have less throat hit. Both the two together, and there's not much you can do to increase it. Pure Grain Alcohol (PGA) in small amounts can help increase throat hit (as well as thin eliquids that might be too thick). Also consider low resistance/higher voltage devices or strong flavors like mints and coffees to increase throat hit for 0 nic or VG blends. Unless you have sensitivity problems with one of the bases, we recommend starting with a PG/VG mix, to get the best of both worlds. Unless stated otherwise on the individual product page, all of our flavors are made with ingredients certified for use in food. We do NOT use Diacetyl or ingredients known to contain Diacetyl, which is approved for use in food, but may produce some inhalation risks. Most of our e-liquids contain a mixture of natural and/or artificial flavoring. If you have known allergies to any particular food items (e.g. nuts, fruits, sweeteners, etc) you should obviously avoid choosing flavors which are likely to contain any of the allergens you have a sensitivity to. If in doubt, contact us first and we'll do our best to help you. We also offer as a standard blend option: Dripper's Blend. Years ago one of our customers gave us the idea when he ordered an all VG blend after previously ordering PG/VG. When we checked to make sure this is what he intended, he told us he wanted it thicker for dripping. Understanding the value of PG in a blend, we set out to better address drippers' needs with quick, easy options. This blend has the thicker consistency direct drippers want without sacrificing as much throat hit and masking less of the flavor. Our PG/VG blend is the most frequently ordered blend, and what we recommend for most customers. Some people have reasons for wanting to go one way or another, but that’s usually decided later on. Ratios may may vary fractionally depending on the flavor. Those can be chosen from the drop down list on the product page when placing your order but you can request any PG/VG ratio you want by putting it in the comment box when you check out. We do not sell 36mg (considered to be super-high), though there are a few merchants that do. Studies have found that vapers actually receive less nicotine per inhale than do traditional tobacco smokers, and they absorb nicotine at a different rate (browse our Health, Safety & Research Category in Links & Info for more information about it). Most people don't notice the difference, though, because we vape differently than we smoke. Smoking involves an entire cigarette in a short period of time, then that is repeated throughout the day. Vaping, however, usually spreads the draws more equally over the course of the day, and we absorb nicotine steadily rather than in short, repeated bursts. In general, one milliliter of e-juice is comparable to one pack of tobacco cigarettes. Traditional cigarettes deliver anywhere from 1.2 to .8mg of nicotine (lights and ultra lights being lowest), but there are so many variables, an ultra-light smoker may use a strength higher than a full flavor smoker, or go through more eLiquid. Please recognize this is a general estimate comparison, and that style, habits and equipment have as much if not more influence on your strength preferences. Heavy smokers (especially heavy, full-flavored smokers) often start with 18-24mg. Light tobacco smokers or those who smoke fewer cigarettes per day (say 1/2 pack), often start with 11-18mg. It's not uncommon for vapers to use different strengths at different times of the day. The most important thing is to listen to your body. Many vapers find they need less nicotine than they expected. The best thing is to use this information as a guideline, then do some trial and error. We recommend new vapers start with at least two, if not three different strengths. It's unlikely any would go to waste. Even if a particular strength is too strong, you can easily dilute it down with a lower strength. E-juice flavors are subjective. What is sweet to one, may not be to another. Everyone's taste buds are different, and none of us have the same number of receptor types (sweet, bitter, etc.) - this is just part of the experience. And the same flavor may taste different at different points in time, and you can even become desynthesized to heavily-used flavors (in which case, stay away from them for a while, then try again). There are a lot a variables to this, but this is especially true for individuals who stop smoking. Also note that most freshly-made e-juices (such as ours) improve after a week or two of "steeping." This is especially true for darker flavors such as chocolate, coffee and tobacco, but some fruit flavors will do this too. You can begin vaping any e-Juice right away, but be aware that a flavor that seems "pretty good" or "moderate" today will likely be awesome or robust in a few weeks. Before vaping for the first time, many people think they want to stick to tobacco or menthol tobacco flavors, since that's what they're accustomed to. But the truth is, when anxious smokers say "Oh, this cigarette tastes so good," they're not really talking about the actual taste - they're talking about the nicotine fix and what that puff of smoke does for them. Tobacco smoke in and of itself does not taste good, and that's why many people smoke menthols - to mask the taste. Very few people find they want to use only tobacco or menthol flavors, and there doesn't seem to be any trend of menthol smokers preferring menthol or mint flavors. The large majority of vapers actually find the taste of tobacco (menthol or otherwise) down-right disgusting once they start vaping. A note to new vapers: Unless you SERIOUSLY adore the taste of tobacco smoke, you'll definitely want to try some of vast variety of flavors available. Some tobacco flavors are pleasant on occasion, especially for pipe or cigar smokers, but in general, tobacco flavorings don't do a really good job of imitating tobacco smoke flavor. Some might be more like actual tobacco than tobacco smoke, which can be very enjoyable for some, but an unexpected experience for others. 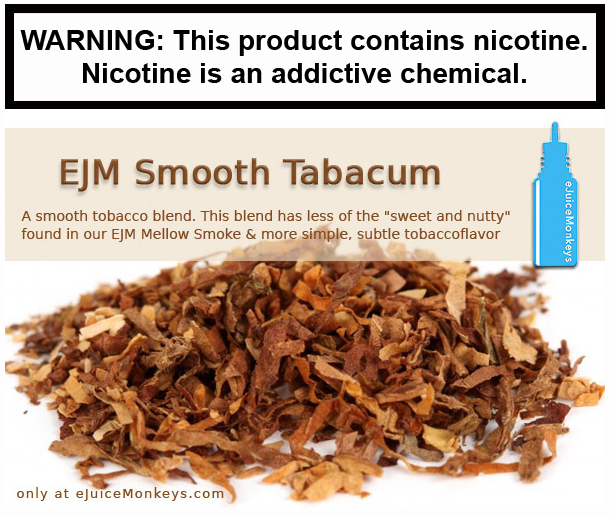 We do sell a few straight and basic tobacco flavors, but most of our tobacco liquids are blended with other flavors to enhance them. But with SO many different flavors to choose from, why restrict yourself to the tobacco smoke mindset? Be unchained....Don't limit yourself. Store e-Juices in a cool (not cold), dark environment. Avoid storing in the refrigerator, as cold temperatures tend to breakdown chemicals and cause them to separate. Likewise, avoid heat and direct sunlight, as these tend to breakdown flavor molecules and e-Juices will begin to taste bland. Shelf life is considered to be two-years. Our e-Juices include an expiration date on the label. If you buy e-Juices from other vendors that do not have an expiration date, you should make note of the date of purchase so you have a general idea what you're dealing with (since you don't really know when it was made). Nicotine is a poison and must be treated as such. Avoid buying e-juices that are not in child-resistant bottles or not properly labeled. The nicotine content in a single tobacco cigarette can kill a small child or pet, as can one millimeter of e-juice liquid. MAKE CERTAIN you properly store ALL of your equipment, cartridges, e-juices, etc. Since adults are not exempt from harm, always leave the drip tip on e-juice bottles to avoid spilling large amounts. Always wash your hands after handling e-juice and wipe spills immediately. E-juice can damage and/or stain furniture and finishes, so always work on a protected surface. You can "overdose" on e-juice nicotine, just like you can when smoking too many tobacco cigarettes in a short period of time. If you experience any symptoms (nervousness, dizziness, rapid heart beat, trouble sleeping, tingling, etc. ), stop or reduce your vaping or switch to a lower e-juice strength. If you take any medications (such as "Antabuse") which may cause you to have a reaction when exposed to trace amounts of alcohol you should consult with your physician before you start vaping as many flavorings (ours as well as most other vendors) may have small amounts of alcohol added and we do use tiny amounts of PGA (pure grain alcohol) in our blends containing Vegetable Glycerin. All of our eLiquids are custom made to your specifications after you order. Due to the nature of this product, and because of differences in personal tastes and preferences we are unable to offer returns, refunds or exchanges for eLiquid products. We highly recommend purchasing smaller bottle sizes or requesting the free sample offered when making another purchase to find flavors suited to your personal taste. If you are truly unhappy with an eLiquid you order, feel free to contact us for suggestions and possible solutions or options, but all eLiquid sales are final. Enjoy the experience of smoke-free vaping and have fun!